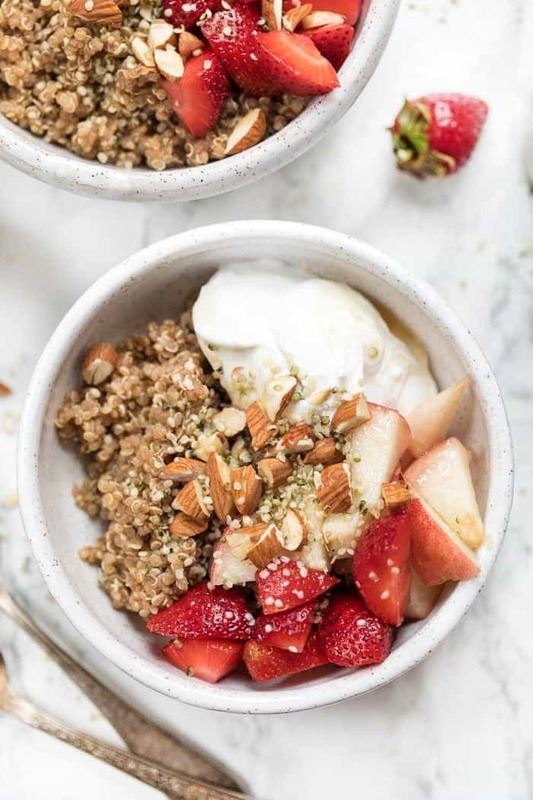 These healthy quinoa breakfast bowls combine cinnamon-spiced quinoa, creamy coconut yogurt, and fruit for the ultimate breakfast! Naturally GF & vegan too! It's been so hot in the city the past week that all I want is something cool and refreshing to start my day. While smoothies and smoothie bowls are my usual fave, sometimes you need to change things up! 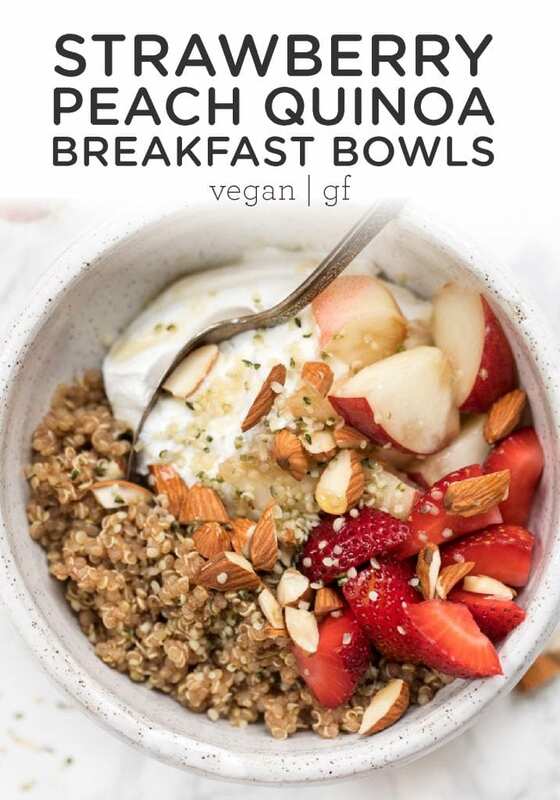 Cold quinoa breakfast bowls are definitely hitting the spot. They're quick to make, don't require any cooking, and you can get all sorts of creative! 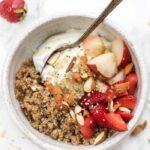 Since we're in the heat of summer, and the farmer's market is bursting with berries and stone fruits, I figured this is the perfect combo – cooked quinoa, strawberries, peaches and yogurt. Can't get any more refreshing! Having cooked quinoa around is a game changer. It's so versatile – I use it in my salads, as a base for my stir-fry, and of course in my breakfast bowls! I typically store mine in a large glass container so I can just pull out what I need for the meal. What's great about quinoa is that it lasts at least 4 days in the fridge and can also be frozen and thawed. 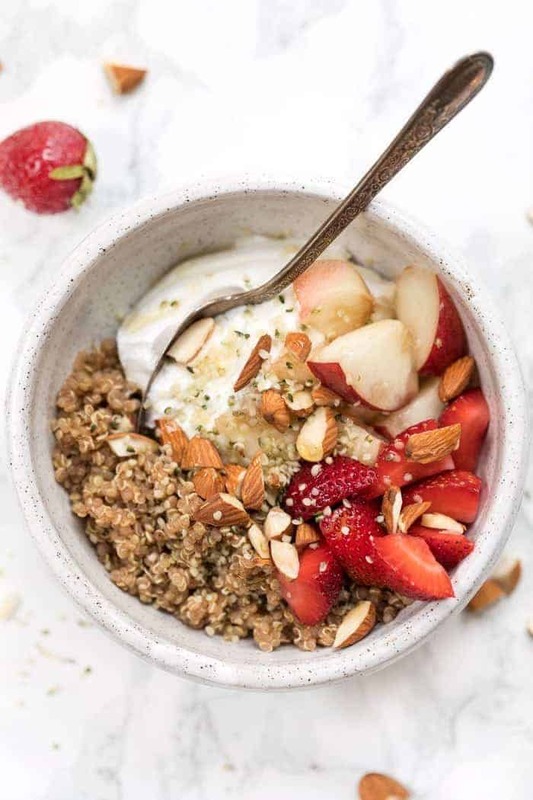 For this breakfast quinoa recipe, we're just mixing some cooked quinoa with a splash of almond milk, maple syrup for sweetness and cinnamon for a little extra boost. Quinoa alone doesn't really do it for me. So for today's recipe, we're jazzing up our standard quinoa by adding in fresh fruit, non-dairy yogurt, chopped almonds and hemp seeds. It ends up having all the right textures, all the right flavors and is such a perfect meal for a hot summer morning. There are so many non-dairy yogurt options out there these days, but I have to be honest… most of them really aren't good. They're either loaded with sugar and way too sweet or are filled with gums and stabilizers to make them the right consistency. The only yogurt I've personally found that doesn't have any of that junk is full fat coconut yogurt. There are two brands that I have found locally (Coyo and Anita's), but you can also make your own. 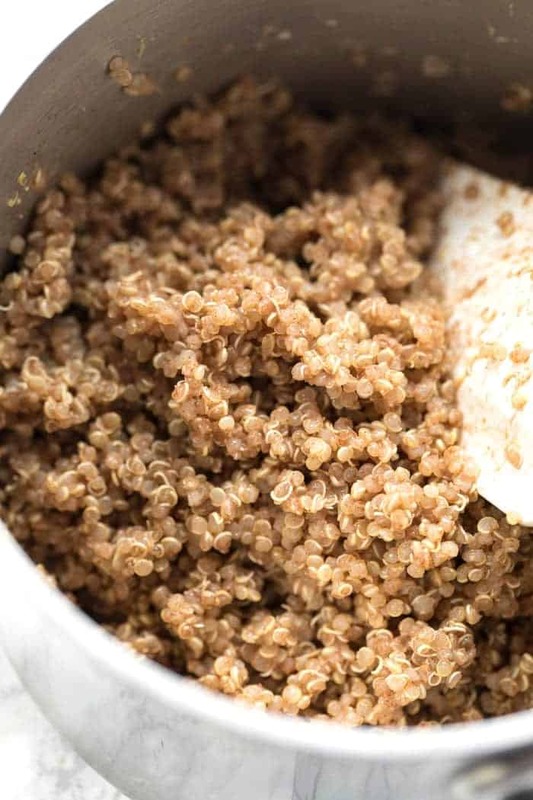 Otherwise, all you need to make this amazing quinoa breakfast recipe is 10 minutes. It's easy, healthy, summery, while still being high in fiber and protein so it's filling and will nourish you all day long! Need a quick summery breakfast? 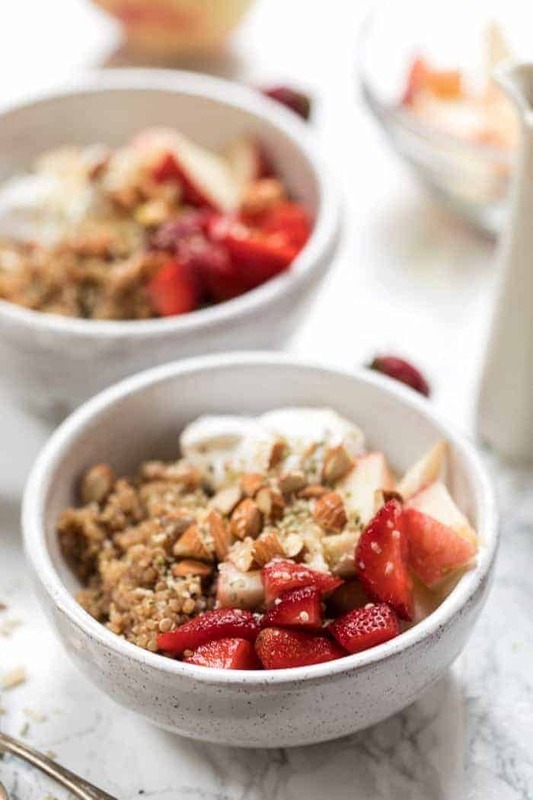 These strawberry and peach quinoa breakfast bowls are the perfect way to start your summer day! Combine cooked quinoa, maple, coconut milk and cinnamon together in a small bowl. Divide evenly between two bowls. Add half the yogurt to the bowl, then top each bowl with half the fruit, sprinkle with almonds and hemp seeds. I made this today, and it is a great summer breakfast! I also used almond milk as I used up the last of an open can of coconut milk in some curry last night. I did use a little less maple syrup. I like the cinnamon, even though it isn’t subtle! I love having a recipe like this that can be customized for personal tastes! Thanks for the great start to my day! What are you cooking the quinoa with? I make a breakfast quinoa with apple juice and top it with vanilla Greek yogurt, strawberries and blueberries. This recipe sounds so delicious and I’m trying to go Vegan. That sounds great! I usually just cook mine with water, but it’s also delicious with coconut milk. I’ll try the apple juice for sure. Would be great for an autumn breakfast! Any ideas of what I can use instead of almond butter? I don’t have any on hand but I really want to make this! Honey maybe? Hi Heather – rather than honey, I would suggest using any nut/seed butter that you do have on hand. Both peanut, cashew or hazelnut would be delicious! This was our first quinoa breakfast 🙂 YUM! Me, my hubby, and our 18 month old LOVED it! My daughter, who is 6, was sad that she spent the night off and missed out 🙂 I will definitely try this recipe again adding the shredded coconut next time 🙂 Thanks for a great healthy recipe! Yay! Thanks for helping me make my first quinoa breakfast, actually, first quinoa meal ever! And it turned out great! I had to vary the recipe with what I had on hand (omitted peaches, didn’t have coconut milk so used almond milk, a bit more than a tbs bc i found the cinnamon a little powerful, and added some unsweetened organic shredded coconut). It was delicious! AND it gave me a way to use my almond butter (I’m trying to go grain-free and almond butter is always suggested as a snack but I just don’t like it lol – is there a brand you recommend?). BEST YET – my 19 month old LOVED it! FINALLY I have a quick grain-free alternative to his oatmeal breakfast! Keep these quinoa breakfast recipes coming please! Thanks so much! Oh my goodness, this just made my day!! I’m so happy that you found the recipe and used it to make your own scrumptious meal. The quinoa bowl sounds delicious and your 19 month old is sure in for a world of healthy foods 🙂 For almond butter, I use the brand Once Again. I think it’s sold in most health food stores and I know you can find it on Amazon. I absolutely love it! What a fun day to kick off summer! I just so happen to have all of these ingredients in the kitchen, so I think I know what’s for breakfast!